From Shopping Cart Price Rule settings, allow you to generate multiple coupons at the time, but you might be have some difficulties to manage them without any confusion. Therefore, we will support you do it effectively with Coupon Usage Report in this post. What is the Coupon Usage Report? Coupon Useage Report is the powerful tool to filter all coupon by time period, order status, and price rule. Depending on your choice, the corresponding coupons will be shown on the coupon report. On the Admin Panel, Report > Sales > Coupons. If there are multiple store views, in the upper-left corner, choose the Store View for showing the coupon report. See the message at the top page, click Statistics link to renew the data of the day. 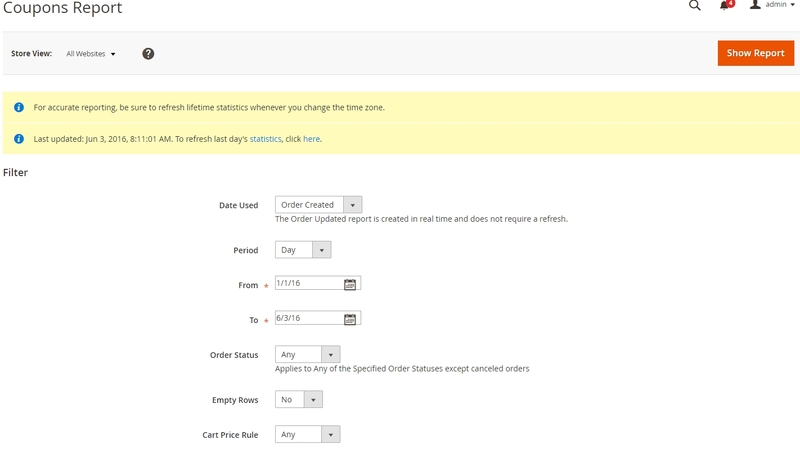 Select Date Used from the dropdown: Order Created and Order Updated while the Order Updated report is created in real-time, and does not ask for a refresh. Set the Period for the report: Day, Month, or Year. Zone the period of time by From and To field. To follow the report with a certain order status, set Specified for the field and choose the status you need. If leave Any, apply to all the Specified Order Statuses except canceled orders. Create omit row without data from the report, choose No in the Empty Row field. Any option is showing all coupon activity from all cart price rule. Specified option is for only one cart price rule. Show Report when complete all and the report will appear the below. Don’t forget clicking Save Config to save all changes.